It is with heavy hearts we announce the passing of our beloved mother, grandmother and great grandmother, Dolores Gardiner on Sunday, September 2, 2018 at the age of 85. 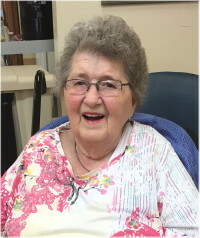 Dolores will be dearly missed by her children Deb (Bob), Laurie (Denis), Rick (Val), Marilyn (Chris) and David (Cathy); 11 grandchildren; 7 great grandchildren and numerous nieces and nephews. Mom was known for her outstanding sense of humour. She had the ability to change a rainy day into a sunny mood with her giggle and optimism. She showed us through her example to be nonjudgmental, to be patient and kind. Mom never lost the innocence of a child as she never let tragic world events cloud her ability to enjoy this beautiful world. She had the ability to see the beauty and wonder in the tiniest hummingbird to the glory of a sunset. Mom knew how to appreciate what really mattered in life. She was never too busy to give of herself to her children, grandchildren and great grandchildren. She was determined to keep going after Dad, James Gardiner, the love of her life of 65 years, passed on April 6, 2018. However, her declining health made this impossible and she got very tired. She did put up a great fight. She will now join Dad in Heaven as she always liked the song “Sweethearts in Heaven”. She would play this song on her computer and cry as she mourned her beloved husband of 65 years. Dolores loved her time going to the cabin at Dorothy lake as did Dad and the family. She’d walk around the yard looking at her flowers, taking in the sunsets and sunrises with a glorious smile on her face as if she was in Disneyland. Thank you to the staff at Pinawa Hospital and Whitemouth Personal Care Home for mom’s awesome care. Dolly and her family were a big part of my growing up years in our neighborhood. Her and Jim were great friends with my parents. She babysat me, and all her children were our partners in crime. I used to love her homemade bread and I find at times I still crave it with a bowl of tomato soup. She was always ready with a hug or a smile. I know she will always be remembered with great fondness by my family. your words are absolutely perfect in describing Aunt Dolly. Thinking of you. She was one of a kind. I don’t think I have a single memory of her without a smile on her face. My thoughts and prayers are with you all. I feel so privileged to have got to know Dolly and some of her family over the past 18 months while visiting at Whitemouth PCH. Dolly was a delight to know and although I didn’t know her in her younger days I can fully believe and imagine her as described in this beautiful obituary. Sending very much love to everyone. You are all in my thoughts and prayers. My deepest condolences to the family. Dolly’s beautiful smile and ready giggle will be so missed. She truly was a ray of sunshine with such a kind disposition no matter the circumstance. My thoughts and prayers are with you. To my MOM…Miss you to the moon and back already. Life will be hard without you..We were so lucky to have you as our mom. Always there for us. So many memories and they will be cherished forever.. Give our loved ones a hug from us and tell them that we miss them all. I am so glad that you and dad are sweethearts again in heaven . Love you and see you some day.